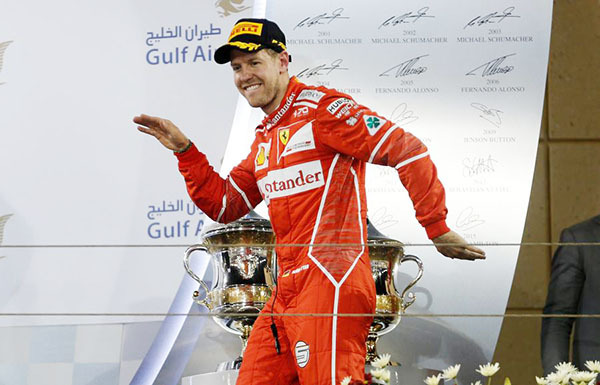 Ferrari's Sebastian Vettel took a thrilling victory in the desert ahead of Mercedes' Lewis Hamilton at the Bahrain Grand Prix on Sunday, putting himself seven points clear to lead the Formula One world championship. Hamilton's teammate Bottas finished third ahead of Kimi Raikkonen and Red Bull's Daniel Ricciardo. The victory was the four-time world champion's second of the season and 44th of his career. After winning the season opener in Australia, Vettel now leads Hamilton 68 to 61 in the drivers' standings. At the start, Vettel got a clean getaway from third to sweep past Hamilton into Turn 1 and trail first-time pole-sitter Valtteri Bottas in the opening laps. "It was a really great team effort today. Right after the start I could feel that 'yeah, we're quick, we can have a word'. So really tried to put Valtteri under pressure," Vettel said after the race. With Bottas leading a tight train of five drivers early in the race, Vettel opted for the undercut, pitting for new super softs on Lap 10, with Red Bull's Max Verstappen following suit from fourth place shortly after. However, the young Dutchmen ran off the track and into the barriers shortly after coming out of the pits, claiming "brake failure" over the team radio. A decisive moment in the race came a lap later when the safety car was deployed for a collision at Turn 1 between Williams' Canadian rookie Lance Stroll and Toro Rosso's Carlos Sainz. The Spaniard was later given a five place penalty to be served at the next race in Russia. The safety car prompted many cars to pit including the two Mercedes who chose to stack their drivers. As second in line, Hamilton drove "unnecessarily slowly" into the pit lane, impeding Daniel Ricciardo and earning a five-second penalty. "The pit lane was my fault, so apologies to the team for losing the time there. I tried my hardest to catch up but it was a long old way to go," Hamilton said. After the safety car, Vettel came out in the lead where he remained after the next round of pit stops, despite an epic fight back from Hamilton after serving his penalty. Williams driver Felipe Massa finished an impressive sixth, followed by Sergio Perez in the Force India, Romain Grosjean for Haas, Nico Hulkenberg scoring Renault's first points of the year, and Esteban Ocon rounding out the top 10. In the constructor's championship, Mercedes still lead on 109 points to Ferrari's 100, followed by Red Bull on 47, Force India on 17, Williams on 16, Toro Rosso on 12, Haas on 8, and Renault on 2. The next round takes place in Russia on April 30 in what is shaping up to be one of the fiercest duals in F1 for many seasons.